The showerhead from Delta is an all-around useful item that will give you an amazing shower from head to toe. Its 2-in-1 design offers easy use, so rinsing away soap and shampoo is a breeze. With a 4.81-inch D, 10-inch H, and 8.19-inch W size, this showerhead is small enough to fit into smaller spaces and gives plenty of water. Best in power and style, this showerhead hand shower combo from Delta gives you an all over clean with every shower. Its 2-in-1 design offers easy use, so rinsing away soap and shampoo is a breeze. It measures 11.13-inch D, 47.25-inch H, and 6.63-inch W to give you a quick and easy way to update your shower. The MOEN Banbury 5-Spray 4 inch Showerhead gives you the optimal showering experience with five spray settings, including a relaxing massage, energizing massage, wide spray, wide spray and energizing massage, and wide spray and relaxing massage. 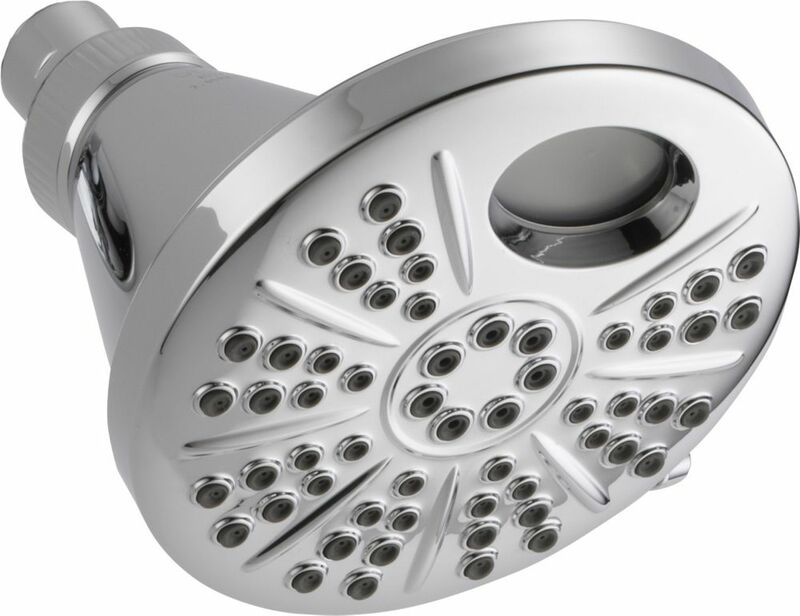 The showerhead has self-cleaning nozzles to help prevent the buildup of minerals for easy maintenance and long-term use. The sleek chrome and seamless design complement any bath decor. Temp2O 6-Spray Showerhead With this top-notch showerhead from Delta, you can expect an amazing head-to-toe clean every time. Its 2-in-1 design really improves your shower time, making sure you don't miss any spots. Turn your bathroom into a spa with this 2.25-inch D, 4.5-inch H, and 4-inch W showerhead, perfect for smaller spaces. Temp2O 6-Spray Showerhead is rated 5.0 out of 5 by 1. Rated 5 out of 5 by gotredmach from Bought this product for Christmas and after an easy install I was ready for my shower. Love the temperature feature. Set the water temp, watch the gauge temp and jump in. Altho haven't had it long a beautifully looking product. Classy.